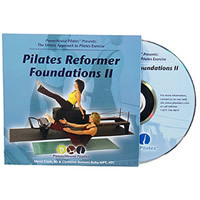 Reformer Foundations II builds on the repertoire of exercises from Foundations I by adding more complex variations. This 40 minute workout includes challenging upper and lower body exercises combined with plenty of training for your core. After the workout there is a set-up, safety and alignment segment where you will learn proper body alignment a DVD 60 minutes.